Last edited by trustyjam on Sun Jan 20, 2019 2:37 pm, edited 1 time in total. Hello and welcome to our thirty-fourth field report! Today, we’re pleased to give you a bit more of an insight regarding some of the content our first combat oriented test phase “Skirmishes” is set to include. The user interface of the technical alpha has long been severely lacking in both functionality as well as its visual presentation. With Skirmishes introducing the first actual game mode and thus likely is going to appeal to a somewhat broader audience, we felt like this was the correct time to give the entirety of the user interface an overhaul. Luckily, we had the great pleasure of welcoming Lee (fitting name if there ever was one!) to the team a few months ago as our new UI Artist. He as well as Anthony, our UI Engineer and George, our Historical Advisor, has been busy working on making the user experience a much better (and prettier one) in Skirmishes while maintaining quite a bit of authenticity. The images below are, as everything, still very much a work in progress but should convey the general direction we are going to you well enough. The main menu will now feature news regarding the game directly in the game. No more hassle of trying to locate patch notes for instance! The main menu will also feature a player profile shortcut (Steam profile for now). The different options menus will now be more streamlined and offer easier selection of preferred settings. The first choice you will be presented with after joining a Skirmish server. So what is it then? bluebelly or greyback? The new regiment and player grade selection screen will allow players to pick regiment, grade (Private, Flag bearer, NCO & Officer), rank as well as a primary and secondary weapon loadout should the selected regiment or player grade allow it. Furthermore it will display ammunition types available for the selected weapon and display weapon statistics also. Finally, there’s the deployment screen. Here you’ll be presented with a map of the skirmish in question as well as a brief overview of the current status of the match (tickets & time remaining) and your previous selections regarding regiment, player grade, rank & weapon loadouts. You will have the option of deploying on the flag bearer of your regiment or in the deploy zone of your faction. The tactical overview (enabled by pressing T) has been overhauled as well to display the status of the capture area, tickets remaining for each faction and the time remaining of the skirmish. 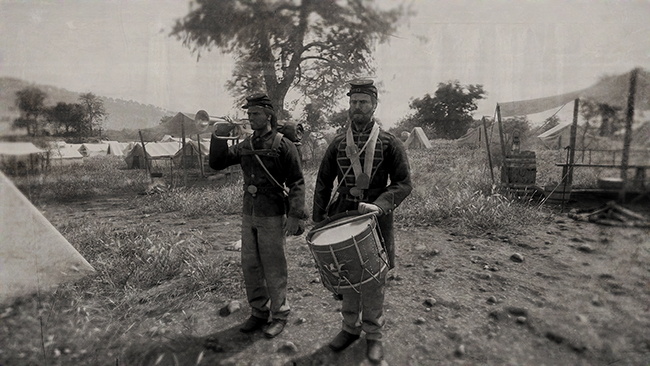 The won/lost screen will provide you with a short description fitting of the outcome of the match of the overall skirmish as well as small after action reports of each regiment engaged and the preliminary casualties of them. 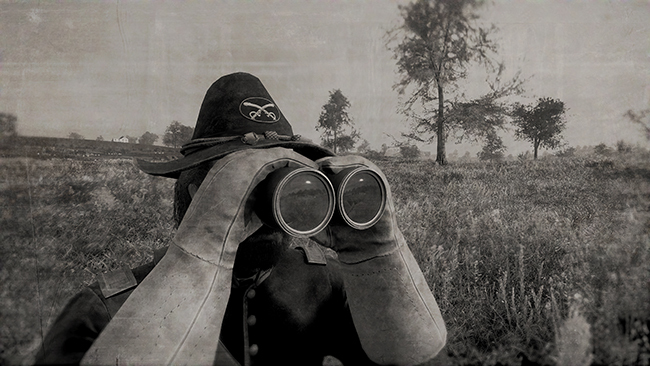 We can’t wait to introduce the overhaul of the user interface with the release of Skirmishes and War of Rights entering its alpha phase in the not too distant future. Our release target window is still in early 2017 and we’re doing whatever we can in order to try and deliver on time. We thought we’d finish off with a highlight of one of the events that left quite a mark during the battle of Antietam: The burning of the Mumma farm. It left a family homeless and the smokestack from it was clearly visible across the entire battlefield throughout the day. The farm was set ablaze just prior to the fighting began due to confederate concerns that the farm might be used as a headquaters for union sharpshooters, giving them a clear vantage point over confederate lines at Dunker Church. Please be so kind as to give me the correct name of the man who owned or lived in the brick house that was burned at the Battle of Antietam or Battle of Sharpsburg, being called by both names. I belong to the 3rd North Carolina infantry, Colonel William L. Derassette, Ripley’s Brigade, D. H. Hill’s Division. This house stood immediately in our front as the battle was being commenced and at times was in the enemy’s lines. General Ripley, to prevent its occupation by sharpshooters and protect his officers from being picked off, ordered it burned. A volunteer call was made as to who would do it. Five or six privates from Company A volunteered and I took charge of them, being at that time, Sergeant Major of the regiment. After firing the house we all got back to our lines, myself being the only one hurt. Ripley ordered me to carry orders down to his line to 44th and 48th Georgia Regiments to come up and take a rail fence in their front. He was shot soon after I left him. I carried the orders down to the Georgia troops and being weak from the loss of blood, went off the field by and old Church and on to our hospital. Then a woman, young and beautiful and blackhaired, helped to bandage my arm. I have often wondered if she was any of the family and where they went when caught between the lines of battle. I wish to write up the particulars of the event truthfully and there are some particulars about the family I would like to have. Mumma farm smokestack from Dunker Church. On the next campaign, Gettysburg, by the command to which I belonged, we assisted to capture General Milroy Winchester, Virginia, and I had to lay up for repairs and did not get any further. My brother, now deceased, said that he saw the old gentleman, or thought he talked with the owner of the house burned, and said that he hoped the next time they fought, they would get out of his cornfields, as he gathered no corn or crops that year. The postmaster of Sharpsburg did not manage to locate the blackhaired woman from the soldier’s tale as she was dead by this time. He did, however, prove to be very much tied to the incident of the house and its burning himself, being the son of its owner. Below is Postmaster Samuel Mumma Jr.’s reply. In reply to your letter of March 19th asking for some information concerning the burning of the brick house on September 17th, 1862, I will say that the house referred to was owned by my father, Samuel Mumma, Sr. The house, a large brick colonial one, near the Dunkard Church, was burned at the Battle of Antietam. My father was told that the family had better get away, so we left on Monday afternoon the 15th, took nothing with us as they were cannonading then and we were afraid that there would be a battle at once. Some clothing was gotten together and the silverware was packed in a basket ready to take, but in our haste to get away, all was left behind. Father and mother and the younger children left in the two-horse carry-all (the older children walking as there was a large family) going about 4 miles and then we camped in a large church called the Manor Church, where many others also congregated. Mumma farm smokestack from Bloody Lane. On tuesday evening a friend and I came back to the house, thinking to get some clothing but found that everything of value had been taken. I then started for Sharpsburg and at the ridge on the field above our house, where the line had formed, General D.H. Hill and some other officers had me brought to them, and questioned me as to whether I was a member of that family. They then asked me about different roads to the Antietam Creek. I gave them a correct statement although I was a Union boy. After we left, my older brother Daniel came back to the house and went to bed. Towards morning some officers knocked at the door and Daniel being young also, was afraid to open the door and jumped out the back window, leaving it up and spent the remainder of the night in the upper room of a stone building that was once used by slaves. The next day he went to Sharpsburg. That morning the house and barn were burned but we were told that General Richardson’s Battery (a Union General) had shelled the house and barn and burned them. Our family then went to a friends house until spring. In the spring of 1863 we rebuilt our house and had just moved in a few weeks before the army went to Gettysburg. As they were passing through to Gettysburg, an officer approached me and asked if I knew who had burned that house. I told him that I did not. Then he told me that he and eight other men were detailed by General Ripley to burn the house and that he had picked a chunk of fire from where they had been cooking and had put it in an open window on to a bed. He told me the color of the quilt and the shape of the bedstead. Mumma farm smokestack from Burnside Bridge. We lost crops, fencing and everything, all amounting from $8000.00 to $10,000.00 and were never recompensed as the Government claimed it was damaged by being right in the heart of the battle. As well as I can remember, the hospital you spoke of must have been at the home of one Harry Reel, southwest of the old Dunkard Church. He had a daughter with black hair. She is now dead and the rest of the family have moved west. That was the nearest hospital that I knew of. Below is a video of Campfire Games historical advisor, George Crecy visiting the rebuilt Mumma farm in the “Battlefield Minutes” series. That’s all we have for you this time around. Here's a few short videos showcasing some of the newly added weapon handling/suppression effects to the Technical Alpha as well as a render of the legendary LeMat grapeshot revolver that is soon making its way into the Technical Alpha. Nine .42 balls & one 16 gauge load of buckshot in the LeMat revolver - an extreme amount of handheld firepower. This game looks so good and I am impressed by the great strides you guys make! Looking forward to each new update. I am very impressed by your work - lots of detail, and background. You have a good understanding of what would give a player a good and memorable experience. 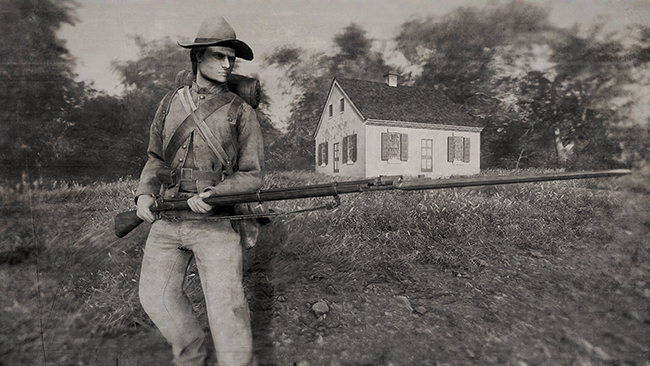 We're currently busy working on introducing Skirmishes, the first combat centric test phase of War of Rights. We can't wait until our backers can start battling it out against eachother! Here are some posters showcasing the available regiments as of now in the Technical Alpha. Field report 35: Skirmishes Available! Hello and welcome to the thirty-fifth field report! Today, we’re very excited to announce the release of Skirmishes Phase 1 - our first combat oriented test phase and also the move from Technical Alpha to Alpha! 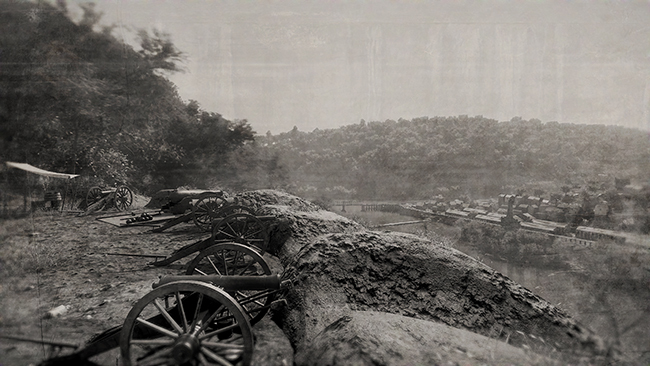 This first, and very much work in progress release of Skirmishes will feature three different Skirmish areas located on the Antietam battlefield for you all to fight on! It features our very first gamemode (attack & defend with team tickets, base spawn waves & a round timer). The game systems will be expanded upon to support features such as the flag bearer spawn system in the near future. The Skirmishes release (update 50) will also feature a number of other content additions such as our new artillery shelling system, first version of the new UI as well as a lot of overhauled game systems. As this release marks our very first big test of Skirmishes a number of bugs & issues, especially with balancing, should be expected. If you encounter any problems please post a detailed description of the issue over at http://www.warofrightsforum.com and we’ll look into it. - Added several dirt map variations for character heads & hands. CSA soldiers are generally less clean than Union soldiers. - Several updates to the character rig in order to optimize performance. - Added additional blanket roll patterns. - Added animated blood pools under dead players. - Overhauled all zouave uniforms. - Added new gunshot sounds with different variants for Springfields, Enfield, Whitworth & Sharps rifles. - Added new breathing sounds. - Added hit & breathing sounds for dying players. - Added Sunken Road/Bloody Lane skirmish area. In this skirmish area, taking place at 9 o’clock, confederate forces will have to push through Piper cornfield in order to take up defensive positions at the Sunken Road. Union forces are deploying close to the Roulette farm and will have to charge over the rise in the landscape, disrupting the visibility of the Sunken Road. - Added Dunker Church skirmish area. This skirmish area is inspired by the half past 10 o’clock push made by Greene’s division from the direction of the burning Mumma farm towards the church which would eventually become the high-water mark of Union forces in the West Woods. - Added Lower Bridge/Burnside Bridge skirmish area. In this skirmish area, taking place at noon, Union forces, having deployed at the Rohrback farm, will have to push across what is to be one of the most iconic civil war battlefield landmarks to date, the Lower Bridge or Burnside Bridge as it would be known after, as well as Antietam Creek only to be faced by a steep slope of heights where the defending confederates will be waiting. - Introduced first version of the new UI overhaul, resulting in a much nicer user experience. - Added drop down menus to the UI for easier option selection. - With the intensive drilling on the Drill Camp, both armies have now advanced their skills enough to reach three shots a minute with their muzzleloaders. - Slightly increased the transition speed from shoulder arms to the ready stance. - Slightly increased the speed of entering melee mode with no bayonet attached (rifle club mode). - Added new recoil animation to characters when firing. Should result in a less “stiff” look. - Greatly reduced the number of instances where animation glitches would result in a framerate drop. - Introduced the initial version of the Skirmishes gamemode featuring: team tickets, capture objectives, round timers and base spawn waves. - Added first, early version of the officer command “Form line”. When spawned as an officer, press Q to place the first end of the line and Q again to place the other. - Added initial version of the artillery shelling system currently being fired from off-map positions in Skirmishes. Take cover behind a fence or inside a building to increase your chances of surviving a barrage. - Overhauled the dynamic depth of field system, making it much better at detecting if the player is indeed looking at a single beam of a fence or not (until this fix, taking cover behind fences and aiming through them was close to impossible due to the dynamic depth of field kicking in). The dynamic depth of field system will also detect glass properly and allow the player to look through it. - Overhauled the freelook system, resulting in no more weird arms placement when using freelook at extreme angles. - Added several suppression effects related to the new artillery shelling system. - Moved away from the experimental graphical feature “Global Illumination” due to a number of bugs. Players should notice a more consistent game visually because of this as well as better performance. - Added different screen effects depending on where you get hit. - Tweaked how the camera effects work when low on stamina. - Reduced radial blur when running. - Tweaked the draw near value for the first person camera resulting in far less clipping when standing close to objects. - Added 3rd Arkansas & 2nd Georgia regiments. - Expanded the focus area slightly when aiming. - Lots of additional fixes & tweaks. - Added lots of new and exciting bugs! - Personal reinforcement tickets & flag bearer spawn system. - Class limitations in regiments. - Continuous updates of the UI, showing correct skirmish area maps in the deploy menu, more regimental info, more detailed winning & losing screens, sound options. - The ability to choose what specific rank & weapon loadout you’d like to spawn with. - Additional Skirmish areas - we have 10 planned and laid out for the Antietam map alone so far. - Balancing! Expect the first release of Skirmishes to be lacking any sort of balance initially. That’s all for today. We’re all looking forward to be fighting with you - and against you, in Skirmishes!